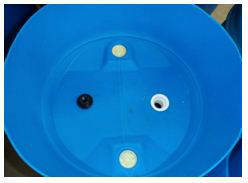 Barrel aquaponics system is basically an aquaponics system that is built around a barrel. It’s a simple system to build and light on the wallet too. This is a project you can start and complete in one afternoon or so. No power tools are required to get this going. All you need is a saw or a jigsaw if you have one and a drill. Well, start by getting hold of a barrel you may have laying in the house that is no more in use or buy one. 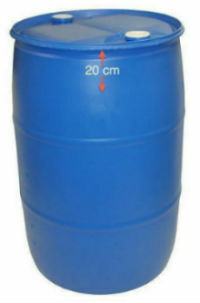 The blue barrels shown here are the 200L variant, and they come in various sizes. Oh, do take note that if you are using an old barrel, make sure you know what was it used for before. If it was used to store any sort of chemicals in the past, it’s best not to re-used it. It’s just because chemicals are difficult to clean. It may look and smell clean, but they always leave residual behind. A friend of mine had the experience of residual acid leaking out of a barrel as he cut the drum. And this is after a thorough cleaning. So, it’s best to stay away from these drums, cause you never know. Right, now after you have rinsed out the barrel you start cutting out the top of the barrel to used as growbed. Measure 8 inches or about 20cm down from the lip of the drum and mark it around the barrel with a marker pen. Next, draw a line by joining the markings together with a flexible ruler. And this is the portion of the drum you will need to cut off. Once you have the cutting line drawn out, drill a hole on the line with a drill. This hole will form an insert for the jigsaw. Start cutting along the line when the jigsaw is in place. You can other tools as well for this purpose. I know of people who use a normal saw or grinder to do this. Which ever way that you are most comfortable with I suppose. But always make sure, safety first and wear proper PPE (Personal Protective Equipment). For this job a pair of industrial safety gloves, safety goggles and hearing protection would be suffice. After you have cut the growbed off give it a good clean, but before doing so make sure you have de-burred the edges. The burr could be a cutting hazard if you don’t. You can do this using sand-paper or scrapping off with a piece of metal. Well, sand-paper would do the job fine here. Now that we have the growbed cut out, what is remained of the barrel would be your fish tank. The idea here is to place the growbed on top of the fish tank. Depending on the type of barrel you using, you may need to make the fish tank opening smaller in order for the growbed to sit properly on the fish tank. You can do this by cutiing V-shaped cuts on the barrel and tying them back together with cable ties. Next, you need to cut an opening at the fish tank, with a jigsaw, to have access to the fish and feed them. It’s important to take note to cut this hole as high as possible to the top of the fish tank so that you can fill more water in it. This opening can of any shape that you fancy, as long as it’s sufficiently sized. Let’s go back to the growbed. You need to cut two holes here. One for the pump inlet and the other for the drainage system. You can use any system you like here. Some people use standpipes and others use siphons. They all work fine. The preference is yours. 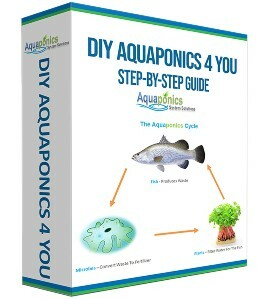 It’s the same principle here as any other backyard aquaponics system. There’s the pump that pushes water into the growbed and a drainage system to deliver the water back to the fish tank. Now that you have your fish tank settled, next would be to fill up your growbed with grow media. Hydroton or LECA would be a good choice here since it’s light and puts lesser load on the fish tank. A quick note, remember to rinse the hydroton first before introducing them to the system. 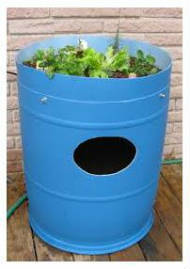 Unless, you want your barrel aquaponics system water to turn brown and murky. It’s time to add water and run the system for at least one week to get the system “cycled”. You will need to carry out periodic water tests to determine good water chemistry balance. 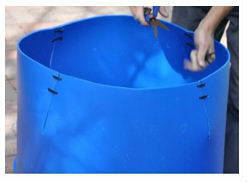 There are different ways you can use the barrels to start your barrel aquaponics design. One of the ways is that can cut the barrels into half to be used as growbeds as shown in the photos below. 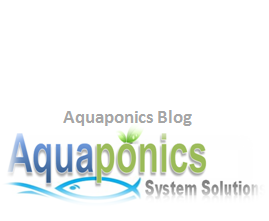 I always say that imagination is the limit when to comes setting up aquaponics systems. 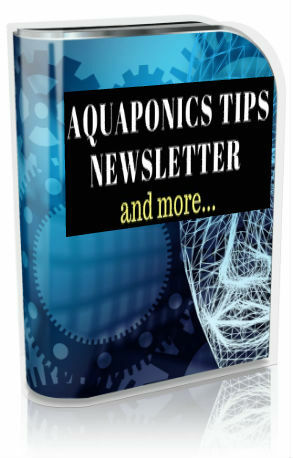 Whether you’re designing a barrel aquaponics system for indoor system use, your backyard or for a larger setup, the same rule applies. Well I hope you have learned something from this and start your own aquaponics systems.